Here’s a powerful technique that changes an okay resume into a great one. This is something I spend a huge proportion of my resume-writing effort on. And it’s the best way to convince a hiring manager that you’re the person for the job. To illustrate what I mean, here’s a before-and-after example from a resume I recently wrote for a gentleman who manages the Streets Department of a city in the Salt Lake Valley. My daily responsibilities as field supervisor include dispatching crews and needed equipment for daily tasks and overseeing the crews in the field that work is being performed to city standards. Okay, this is too wordy, but it gives us some good understanding of this gentleman’s job duties. He assigns and supervises the crews that perform street work in his city. Saw major decrease in citizen complaints regarding roads and infrastructure by effectively managing crew to quickly and efficiently perform needed repairs. This is more tightly worded and is organized into resume-speak bullet form. But what really sets it apart is that it goes beyond what he does and identifies the benefits of what he does. It goes beyond describing his daily responsibilities and explains a result of his work filling those responsibilities; namely, his city has seen a major decrease in citizen complaints. That outcome (decrease in complaints) tells us that he is good at his job. So if I’m making a hiring decision between him and another person with similar experience, I’m going to take a second look at this guy. The one who is showing me real results. I call this connecting the dots. Sure, to write a resume you have to make a list of the stuff you do at work. But to make a great resume, take it a step further and identify the outcomes or results from the stuff you do at work. 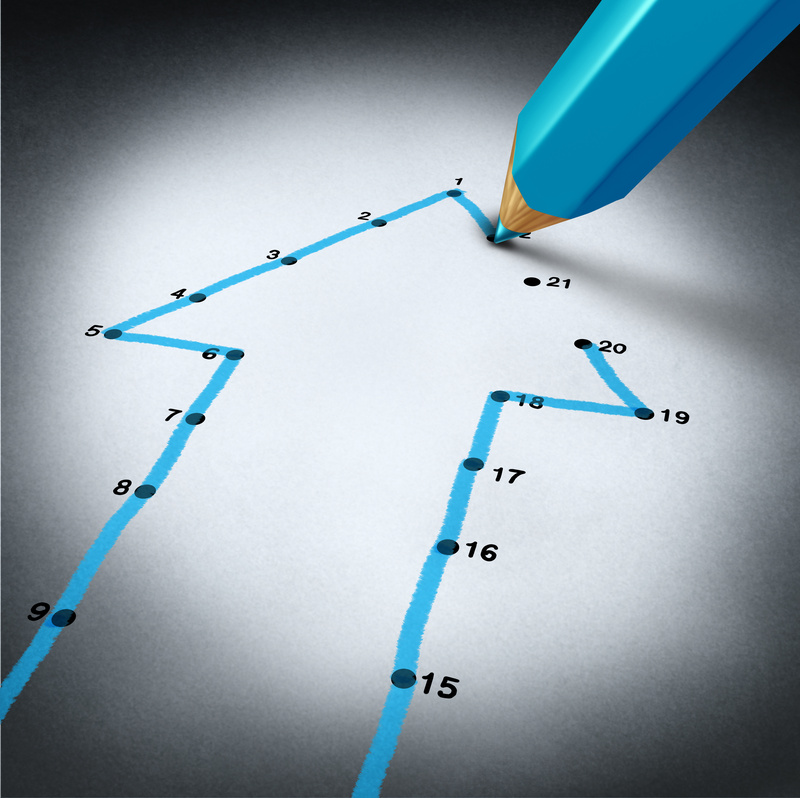 Connect the dots and draw a line from what you do to the benefits the employer sees. Responsibilities include budgeting, hiring, performing staff reviews, planning for capacity and availability. System services is responsible for maintaining a Microsoft Server environment (200+ servers), Hitachi SAN (340TB), IBM AIX unix environment, Redhat Enterprise Linux (400+ servers), Commvault backups, and Foglight proactive monitoring. So one problem is that this provides way too much detail. But did you notice the big red flag? It’s the phase “responsibilities include.” That phrase is a sure-fire sign you are listing responsibilities that need to be transformed into accomplishments. Revitalized underperforming department with low morale and poor credibility by implementing sound operational and project management systems for team maintaining 200+ servers. Don’t just say you’re good at your job. Explain costs you’ve saved, clients you’ve brought on, revenue you’ve added, new products you’ve launched. And for bonus points, put a number on each bullet point in your resume, even if you’re making an educated, rough estimate. I’ve created a little something to help you out with this process. 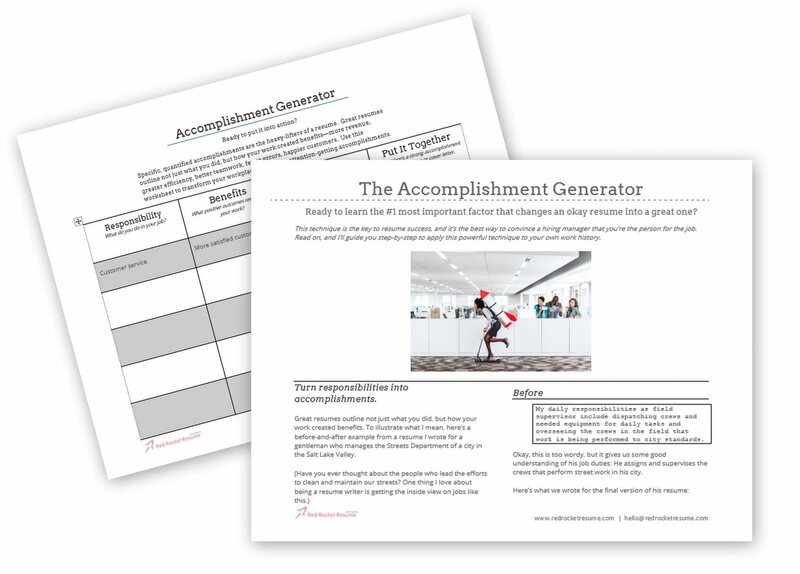 It’s a downloadable pdf worksheet called the Accomplishment Generator, a step-by-step, fill-in-the-blanks guide through the process of turning a responsibility into an accomplishment. Click here to download the Accomplishment Generator.